Gulag : a history · One Book. One Author. One Hour. Notes on front and back endpapers record statistical information about the Soviet concentration camps - their number, the time frame of their existence, the number of prisoners held there - as well as historical information about the camps and their economic significance. Prisoners built the White River Canal for example and later contributed to the wartime industry. Alexander Solzhenitsyn's book 'The Gulag Archipelago' first called attention to these camps. Other notes refer to the existence of two separate prison systems in the Soviet Union - one for ordinary criminals and one for political prisoners; to the Great Terror during Stalin's reign, his show trials, his quotas for arrests of 'enemies of the people', and the high mortality rates of prisoners during the war years (2 million). Also included are notes on the horrific conditions on the transport trains to the camps, on the conditions endured by women, homosexuals and lesbians, and children in the camps, who were separated from their mothers, notes on attemtped escapes, the presence of foreign prisoners in the camps - e.g. 600,000 Japanese at the end of the war, on Khrushchev's 1956 secret speech in which he condemned the 'cult of personality' around Stalin, and, later, the possibility of networking within the camps in the 1970s and 1980s which eventually contributed to the break-up of the Soviet Union. It is also noted that the Russian government has never investigated or tried the perpetrators of torture and mass murder in the camps, and it is pointed out that as of 2001, 13 of the 15 former republics are run by communists who have a clear interest in concealing the past. Members of the secret police still enjoy their privileges while their victims have remained poor and marginalized. It is also noted that prison camps still exist in North Korea. -- These questions and statements are part of the notes: "What was tufta? What was the "Big prison zone"? - "Give an overview of what happened in the camps and prisons at different times." - "What role did Leon Trotsky play in all this?" - "Did they believe in what they were doing?" - "The Cultural-Educational Department inside the Gulag - what did it do?" - "We are forgetting why we fought the cold war." - "What were the "blank spots"?" - Annotations by Brian Lamb in the margins and underlining of pertinent phrases throughout the book. -- Examples: p. 441: "... a senior American politician visited the Gulag, for the first and only time. Henry Wallace, Vice President of the United States, made a trip to Kolyma in May 1944 - and never even knew that he was visiting a prison. Wallace's visit took place at the height of Soviet-American wartime friendship, the warmest moment of the alliance, when the American press was wont to describe Stalin as "Uncle Joe"." -- p. 565: "In my subsequent travels around Russia, I encountered these four attitudes to my project again and again. "It's none of your business," and "it's irrelevant" were both common reactions. Silence - or an absence of opinion, as evinced by a shrug of the shoulders - was probably the most frequent reaction. But there were also people who understood why it was important to know about the past, and who wished it were easier to find out more." 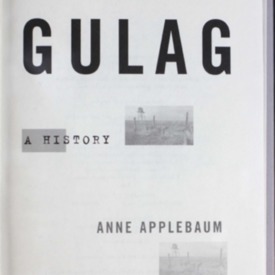 Applebaum, Anne, “Gulag : a history,” One Book. One Author. One Hour., accessed April 24, 2019, http://booknotes.gmu.edu/items/show/604. A fully documented history of the Soviet camp system, from its origins in the Russian Revolution to its collapse in the era of glasnost. Anne Applebaum first lays out the chronological history of the camps and the logic behind their creation, enlargement, and maintenance. Applebaum also examines how life was lived within this shadow country: how prisoners worked, how they ate, where they lived, how they died, how they survived. She examines their guards and their jailers, the horrors of transportation in empty cattle cars, the strange nature of Soviet arrests and trials, the impact of World War II, the relations between different national and religious groups, and the escapes, as well as the extraordinary rebellions that took place in the 1950s. She concludes by examining the disturbing question why the Gulag has remained relatively obscure, in the historical memory of both the former Soviet Union and the West.